Dictionary of the Turkmen terms of hunt with the use of birds - about 80 termins and definitions. The book is written on the base of historic and folklore material, special literature on ornithology. Number of printed copies - 150. Bibliography - more than 200 titles. Brief bibliographic review, including works on Turkmenistan (G.P.Dementiev, D.Ovezov, A.Orazov, A.Rustamov). 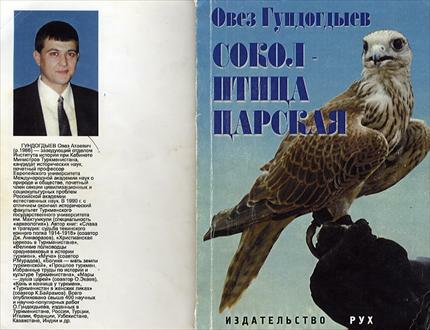 Legends and materials on hunting with birds in the East (Orient) and in Turkmenistan History of falconry and hawking. Very rare book. Number of printed copies - 150. Introduction. 3. Chapter I. "Be afraid of the sharp-billed vultures". 10. Chapter II. From the history of falconry. 42. Conclusion. 84. Remarks. 90. Brief Turkmenian therminological dictionary. 98. The most known falconers clubs throughout the world. 101.